Have you ever stared at your to-do list and felt yourself getting more and more stressed out? Or worried you’re never going the reach the end? There have tons of times I’ve become frantic thinking about how many things I need to get done, with only 24 hours in the day. It’s taken me many stress-filled days to realize organization was the answer to conquering my growing to-do list. I knew I wasn’t alone in my stress; 83% of US workers are stressed and nearly 70% of workers feel as though they have too much work on their plates. You might think getting a little bit done on each part of your to-do list will help make a dent in it, but you’re wrong. Multi-tasking is one of the worst things you could do for your productivity. Not only are you over-committing, you’re creating more distractions for yourself. Instead of trying to do everything at once, focus on getting one thing completely done at a time. This will allow you to put all your thinking into that one task and truly focus. Then once you’re done, you can close that thought process and move onto the next one. In order to keep things moving along, you need to organize your to-do list proactively, perhaps each and every night. This will allow you to re-evaluate what you’ve completed and what needs to be moved onto the next day. Completing your to-do list the night before also gives you a chance to hop right into your tasks the next morning. Think you can write a 2,000-word blog post, 10 emails, and have 3 meetings in one day? Maybe if you want to work until 10 pm and stress yourself out even more. Once you get a task, make sure you’re setting a realistic due date for when you can get this done. As you set a date, take into consideration everything else you have due on that day already and how important it is to get it done by a certain time. Once you have everything organized by the date it actually has to be done, you’ll be able to take that added pressure off yourself. Starting a task without all of the required information or assets will only derail you when you get started. For example, if you need to send an email to your database, do you have the list you need to send it to? If not, then creating that list needs to be an additional task on your to-do list. If not, move it down the list and only add it back into your day once you’re ready. I know everything might seem like a top-priority at times, but it’s likely they can wait a day or two. If others are relying on you to get something done by a certain time, they need to appear first on your list. After that, focus on what you need to get done for yourself that day. Everything else can wait until the next couple of days. Once your list is ordered by importance, put all of your attention on those important items and keep moving down the list as far as you can without getting yourself stressed out. After you’ve set up your to-do list by priority, group similar tasks together (as best you can). Once you’re in the flow, it’ll be easy to move onto a task that’s similar to the one you just finished. Your line of thinking won’t have to change as drastically as it would with a completely different type of task. In today’s day and age, you’re always connected. Whether it be on your phone, email, or in our case, Slack, there’s always a way for people to contact you no matter what you’re doing. One thing that’s really helped me keep focus is to set times during the day where I turn off ALL notifications and power through my work. I’ve noticed I not only feel more accomplished but the work I produce is so much better! You don’t have to stay offline for long, but try to set no notification intervals a couple times a day where you don’t allow outside distractions to slow you down. These alarms allow me to refocus my thoughts and catch myself if I’m multitasking or using my time unwisely. Try setting one at first and see how much it helps. If it doesn't, start setting a couple more to stay on top of your day. This one may seem like it won’t affect your to-do list at all, but it’s been proven that messy environments can break your focus. When you surround yourself with an unhealthy physical space, you’re only creating more of an unhealthy mental space. So, each morning, tidy up your desk a little. Get rid of any trash, knick-knacks, and clutter that may make your workspace feel disorganized. Another bonus tip since we’re all on our computers every day, clean up your desktop as well. Make sure you don’t have a million files and folders making it difficult to find what you need when you need it. Keep everything nicely organized and off your screen to create a cleaner digital workspace. When you’re creating to-do lists, it’s easier to focus on the task at hand, rather than focus on the bigger picture of it all. Thinking about what each task means to your long-term plan helps you keep a sense of accomplishment with even the most mundane tasks. This will also help make sure each task you’re doing is actually working towards a goal. Is adding a hover effect to your call-to-action going to make more visitors click on it or is it just something cool? Being able to ask yourself this each and every day will make sure you’re always working towards reaching your goals. When most people are creating a to-do list, they tend to keep day-to-day activities like answering emails, taking a lunch, or responding to coworkers off, even though they take time. Adding these “unscheduled” items gives you a more realistic picture of your day. You don’t have to add in each item individually, but adding an additional 15-20 minutes to your to-do list allows for those unexpected interruptions. Did you know physically checking things off a list helps you feel a greater sense of accomplishment? A similar feeling can be accomplished with a done list. Once you’ve completed something on your to-do list, move it to a separate done list. 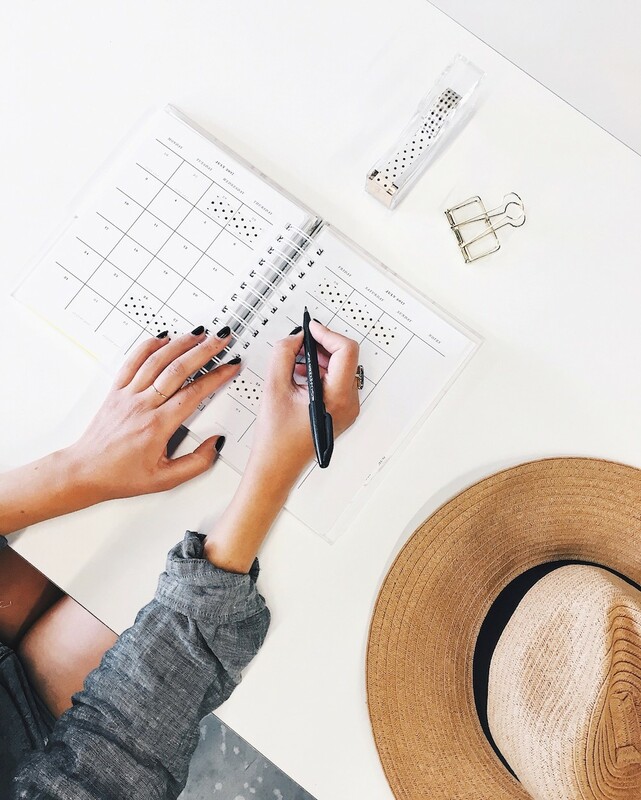 At first, it may seem like something that doesn't affect you much, but as your done list fills up and your to-do list empties, you’ll feel more accomplished with your day. Trust me, every night when I look at my done list I’m just thinking of ways I can add more to do it tomorrow. Yeah, yeah, I know another list, but trust me this one is worth it. When I created my first “waste list,” where I add everything throughout my day that end up creating more work for me or my team, I was shocked at how many elements of my day were creating more work for me and my team. For example, taking five minutes out each morning to answer a team member’s question on functionality notes for a client, when I could have given it to them from the start, were five minutes I wish I had back each and every morning. So yes, create this extra waste list because at the end of the week you’ll start removing wasteful items off your daily to-dos. Sharing your to-do list with others does more than hold you accountable to get things done (though that doesn’t hurt). It actually makes you more efficient. If others are viewing your tasks, you’re more likely to make them more specific and detail-oriented. Each week at IMPACT, we plan our to-do lists together as a team. Then, in scrum fashion, each day we share what we did the day before, what we plan to do today, and what’s holding us back from completing things on our list. This helps us work as a team to hold each other accountable for everything we say we’re going to work on for that day. Try sharing your to-do list with a co-worker, friend, or even your family to help keep yourself on track with your to-do list. Staying organized is tough on your own, so try using a tool to help! At IMPACT, we use Jira to help us lay out our tasks. If your company works in an agile environment, using Jira is best for you. It allows you to plan everything out on a weekly then daily basis and connect everything back to a bigger goal. Trello is a great tool for creating a more personalized to-do list. When we used Trello as an organization, I used to have a Monthly, Weekly, and Daily To-Do list, along with a couple more that contained templates or documents that I accessed often. Reminders is an underrated organizational tool I also use to help me stay on track. You could always create a list right within the app, but what I really use it for is weekly/daily reminders about things that will help me complete my tasks. For example, I have weekly alarms to record each one of my calls to help me keep better notes and listen back for more details. This helps fill in the blank for some tasks that I needed a couple more pieces of detail from. Check them out and see which one works best for you or if you’re like me you can use all three! 16. Don’t Forget to Breath! I know this one is much easier said than done. Sometimes you can’t help but get stressed out by everything on your plate for the day. What I mean by this one is don’t let your to-do list stress you out. It’s not the end of the world if the day is coming to an end and you still have a couple things left. If you followed your priority list then these things aren’t mission critical and can move to the next day. Remind yourself of this next time the day is coming to a close and you still have a couple things left over. While some of these things work great for me, they might not work for you. Make sure that you’re personalizing each one of these tips to fit your needs. If you find that creating a to-list each morning rather than every night is better for you then do that. Use this list as a foundation for managing your to-do list and then build upon it. Let us know what works or doesn’t work for you in the comments below!